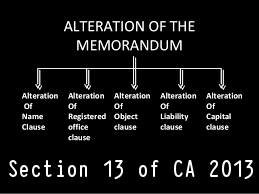 (1) Save as provided in section 61, a company may, by a special resolution and after complying with the procedure specified in this section, alter the provisions of its memorandum. Provided that no such approval shall be necessary where the only change in the name of the company is the deletion therefrom, or addition thereto, of the word ―Private, consequent on the conversion of any one class of companies to another class in accordance with the provisions of this Act. (3) When any change in the name of a company is made under sub-section (2), the Registrar shall enter the new name in the register of companies in place of the old name and issue a fresh certificate of incorporation with the new name and the change in the name shall be complete and effective only on the issue of such a certificate. (5) The Central Government shall dispose of the application under sub-section (4) within a period of sixty days and before passing its order may satisfy itself that the alteration has the consent of the creditors, debenture-holders and other persons concerned with the company or that the sufficient provision has been made by the company either for the due discharge of all its debts and obligations or that adequate security has been provided for such discharge. (b) the approval of the Central Government under sub-section (2), if the alteration involves any change in the name of the company. (7) Where an alteration of the memorandum results in the transfer of the registered office of a company from one State to another, a certified copy of the order of the Central Government approving the alteration shall be filed by the company with the Registrar of each of the States within such time and in such manner as may be prescribed, who shall register the same, and the Registrar of the State where the registered office is being shifted to, shall issue a fresh certificate of incorporation indicating the alteration. (ii)the dissenting shareholders shall be given an opportunity to exit by the promoters and shareholders having control in accordance with regulations to be specified by the Securities and Exchange Board. (9) The Registrar shall register any alteration of the memorandum with respect to the objects of the company and certify the registration within a period of thirty days from the date of filing of the special resolution in accordance with clause (a) of sub-section (6) of this section. (10) No alteration made under this section shall have any effect until it has been registered in accordance with the provisions of this section. (11) Any alteration of the memorandum, in the case of a company limited by guarantee and not having a share capital, purporting to give any person a right to participate in the divisible profits of the company otherwise than as a member, shall be void.